Cat Faeries Catnip Meow Mist in a spray bottle is a pure undiluted hydrosol, or floral water, made from our legendary, notorious, and exclusive ethically wild crafted catnip. There is nothing like it. You will not find Catnip Meow Mist anywhere else - it is available only on our website. We took several pounds of our catnip to a mountain top in Northern California’s wine country to be distilled in a Portuguese copper still by a master at distillation. We employed the exact same reverent, precise and ancient manner used for the highest quality rose and lavender hydrosols. Back at our cat cave and office we bottled it up in an easy to hold 1 oz. mister bottle and a handy 4 oz. refill bottle. It's pure, it’s the real thing, and it's undiluted with no fillers or additives or preservatives. We think of Catnip Meow Mist as "The Signature Fragrance of The Modern House Cat!" It seems like every celebrity has their own fragrance these days, and since every cat is a celebrity in their own home, cats must have their favorite aroma that follows them everywhere that they go! To make your cats blissfully happy: Spray it in the air and watch your cat be elevated into olfactory bliss. Anoint your cat's favorite toys, all of their belongings (isn't that everything in house? ), spray inside cardboard boxes, on old toys to make them appealing again, on cat beds and cat perches and condos, on sofa cushions, and all the favorite snoozing places. Just don't ever spray the cat - it scares them, they hate getting wet! Catnip Mist is a fun and friendly experience for all cats! And for you - no crumbs to sweep up after your cats have had their fun. Would you like your cat to love you even more? Spray some on yourself! Treat your Catnip Mist as if it was a fine wine. Don't keep the bottle in direct sunlight. It's happiest stored in the fridge. The "best used by" date is hand written on your bottle. 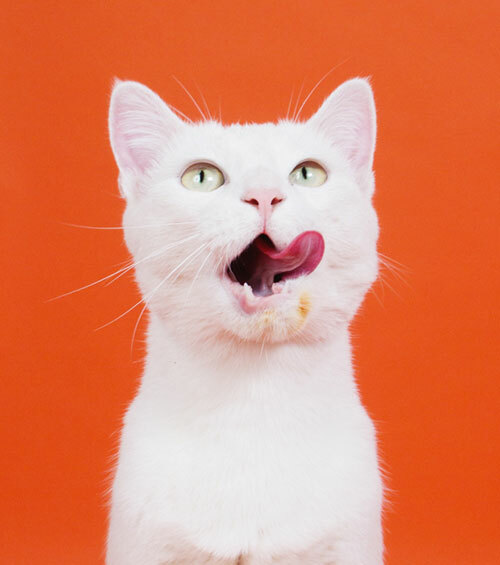 "I love it because unlike dry catnip I don't have crumbs to clean up! My cats are very attracted to the spaces that I had sprayed Catnip Meow Mist and it seems to relax them more than amp them up. They seem so content and calm. They seem so happy!" Add a Mister Top for $1.00? This 4 ounce bottle makes refilling your 1 ounce bottle easy! The bottle comes with a cap. But if you would like a mister to fit this size bottle you may order one for just $1. This is the photo of Gertie selected for our new Catnip Meow Mist label. Gertie is quite a model, ready to strike a pose and lick her lips at the sound of a can opener, the refrigerator door, and of course the sound that a bottle of Catnip Meow Mist makes when it’s being sprayed around the house! Even as a teenager, Gertie loved licking her lips when happy or hungry! So she made the ideal spokes-model for Cat Faeries “Catnip Meow Mist!” Here is a short video of Gertie all excited over dinner time! Cat Faeries co-founder Betty made a rare appearance at Saks Fifth Avenue, San Francisco, CA October 26, 27, 28, 2007! The terms of the deal are being kept a secret, but someone partially let the cat out of the bag, and word has leaked that Betty the feline founder of Cat Faeries is the face of Cat Faeries Catnip Mist, The Signature Fragrance of The Modern House cat. Our sources tell us that Betty was quoted as saying "I don't wake up from a catnap for any less than Dave's Albacore canned crab." The rumor mill is spinning with stories that Betty has been paid with 10,000 cans of Pacific Coast Dungeness Crab which harkens back to the late 80's when supermodels Linda Evangelista and Christie Turlington would not get out of bed for less than $10,000. In a recent interview Betty was asked which human supermodel she most relates to. "silly question, why Naomi Campbell of course. She knows how to treat her staff and handlers. If one displeases her, she'll hurl a telephone. If one of mine displeases me, I'll hurl a furball." Betty's agent, manager, and litter box attendant are dogging questions about what everyone is curious about: Betty's contract with Cat Faeries, the whereabouts of Betty, and who her favorite tom cats are. All we know is that San Francisco photographer Pat Boyd is Betty's exclusive photographer. "Only Pat can capture my essence, my soul, my rare beauty." a recent press release states. Betty was last seen lounging on a fleece bed with a half empty can of crab and an overturned bottle of Cat Faeries Catnip Mist by her paw, purring "I see so many pretty colors." Disclaimer: Saks Fifth Avenue is very real. October 26 - 28, 2007 Saks' San Francisco store had a window display of photos of animals taken by Pat Boyd to promote a benefit for Pets Unlimited. Betty, Cat Faeries founder and muse, was one of the cats featured in the window at Saks. Cat Faeries decided to have some fun. Cat Faeries took photos of that window display. Then with Pat's permission we altered one of those photos using Photoshop. We Photoshoped out the photos of the other animals, and interested bottles of Catnip Mist so that it would look like Saks was featuring Betty and Cat Faeries Catnip Mist. Saks Fifth Avenue, Pets Unlimited, and Pat Boyd are not responsible for the creation of this promo. Saks Fifth Avenue does not sell Catnip Mist. This is a fantasy dream sequence created by and written by Cat Faeries. Betty crossed the Rainbow Bridge in 2009 where she channels her love and demands to us, daily.